With more than 17,000 islands, 1427 reef fish and over 600 coral species, Indonesia is one of the most biodiverse diving destinations in the world. At the heart of the Coral Triangle, it provides a variety of dive sites that will please beginners, most experienced divers and dive professionals. There is a lot to do on land too. From Java to Raja Ampat, we have selected five experiences you can do when you don’t dive. Indonesia variety of marine life, topography and conditions makes it one of the most interesting dive destinations in the world: coral gardens, walls, wrecks, macro and muck dive sites, you can dive it all! Many of the destinations of Indonesia are suited for drift diving as there is often strong currents. Finally, with its multitude of islands to discover, it is a country you can come back over and over. Bali is often called the “Island of Gods”, and after spending a few days there you’ll understand why. Volcanos, rice fields, temples, cliffs, beaches, there is a lot to do on land. Underwater, it’s not bad either with many dive sites for beginners and more advanced divers: some wrecks in North East Bali, manta points off Nusa Penida and some coral gardens. Going with a dive shop based in Bali, Indonesia will ease the logistics to go diving around the island. Bali is a perfect starting point to explore Indonesia. There are direct flights to Komodo, to Manado and to Makassar if you’re on your way to Raja Ampat. Komodo National Park is only an hour and a half away from Bali by plane. A World Heritage Site and a Man and Biosphere Reserve by UNESCO, it is located on Lintah Strait, bringing sometimes very strong currents, but also lots of life! This is an area for experienced divers. Its biodiversity is very high, with 1,000 species of fish and some 260 species of reef-building corals. To fully explore the National Park, you can either embark on a liveaboard from Bali to Komodo chose to go to Sebayur island, located in the North of Komodo National Park and dive from there, or even stay in Labuan Bajo, Flores main city and dive on a daily basis. Bunaken Marine Park, north of Manado in Sulawesi, offers some incredible wall dives and great macro opportunities for photographers. The marine park comprises five islands - Bunaken, Siladen, Mantehage, Nain and Manado Tua, some of which go as deep as 600 meters (1,968 feet). Expect to see beautiful soft and hard corals, some butterflyfish, sweetlips, cardinal fish, mandarin fish, turtles, sharks, barracudas, and also some amazing critters: nudibranch, seahorses and more. Bunaken is suitable for both new and experienced divers. The walls are particularly suited for deep dives. Probably the “hottest” diving area right in the world these days, Raja Ampat offers spectacular reefs. It is one of the most bio-diverse marine life in the world along with East Timor, and there are gorgeous island formations. With some fantastic eco-resorts dedicated to scuba diving, Raja Ampat is a paradise for nature lovers, and as there is a lot to do, even non-divers will like it. Backpackers will opt for an “à la carte” eco-resort in North Raja Ampat that offers a flexible package of two, three or more dives a day. If you want to explore all of Raja Ampat, North and South, you will need to embark on a liveboard. In the South, Misool eco-resort is particularly famous for its Marine Protected Area created in 2005, helping Raja Ampat flourishing with abundant species. After swimming with juvenile black tip sharks in Misool eco-resort lagoon, you’ll find it hard to believe it was once a place where sharks fins were being trafficked. Padang Bai: there are about ten dive sites in Padang Bai area with crystal blue waters and great visibility - usually 25 meters+ (82 feet+). Sites range from soft and hard coral gardens to muck diving with many critters, making it a place of choice for photographers. USAT Liberty Wreck: off Tulamben, north Bali, the wreck is a former USA Army cargo ship that was torpedoed by the Japanese in 1942. A shore dive suitable for both day and night dives, its depth ranges from 5 meters to 30 meters (16 to 98 feet), making it also suitable for snorkelers. With nice swim throughs, big schools of fish and usually good visibility. It is a really good dive site to practice your underwater photography skills. Amed Japanese Wreck: not far from Amed, this wreck was a japanese patrol ship sunk in 1942. Less impressive than the USAT Liberty in size, its depth is rather shallow, from 2 meters to 12 meters (6 to 39 feet), making it a good dive sites for level 1 divers. Menjangan Island: at the center of a marine protected area North West of Bali, Menjangan offers excellent wall dives between 20 to 30 meters (65 to 98 feet) depth, a rich macro life and very few tourists compared to other dive sites of Bali. Crystal Bay and Manta Point, Nusa Penida: the island is actually right off Lombok, but many dive shops go there from Bali or Nusa Lembongan on a daily basis. You’ll be able to dive on various sites such as Crystal Bay where you can see Mola mola from mid-June to early October, or the famous Manta Point in which you’ll get to see resident mantas rays. Manta point is suitable for snorkellers too. By taking pictures of mantas belly markings and uploading them to the MantaMatcher NGO’s website, spécialized in identifying manta rays you will contribute to their research and protection. Manta Alley: one of the most iconic dive sites of Komodo National Park. It comprises a manta ray cleaning station at a depth of about 20 meters (65 feet). With usually medium to strong currents, the water is usually a bit colder and it is a dive site for experienced divers who are comfortable in currents. Castle Rock: a site with pinnacles that start at 4 meters down to a shelf of 20 to 24 meters (65 to 78 feet). There are very strong currents, but also a lot of life! Crystal Rock: with strong currents attracting big marine life - grey reef, white tip reef sharks and giant trevallies - it is one of a series of sea mounts that make a chain with Castle Rock and Gili Lawa Laut. Batu Bolong: at the surface there is nothing much except that “Hollow Rock”. Down there you’ll find great schools of fish, napoleon wrasse, giant trevallies, tuna and even some white tip sharks if you’re lucky. The reef goes down to 70 meters (229 feet). With usually strong currents, it is another site for advanced divers used to dive in currents. Cauldron aka Shotgun: probably one of the strongest currents you’ll get to dive into, but also a very rewarding dive site. You’ll drift along a wall filled with a variety of corals and fish before getting shot through the funnel into a cauldron: a bowl with a sandy bottom and walls covered in gorgonian fans and soft corals. A rollercoaster dive only for super experienced divers. Lekuan 2: this site off Bunaken island is a beautiful vertical wall with plenty of hard and soft corals and usually great visibility. With fantastic overhangs and small caves, it is a famous site for wide-angle photography. Ron’s Point: located at the southern tip of Bunaken island, the site starts with a slope leading to a large plateau at about 35 meters (114 feet) depth. As two currents meet each other, it is a spot where pelagic life can be seen: sharks, huge tunas and eagle rays. Great macro too with leaf scorpion fish, seahorses and many others. Mike’s Point: north of Bunaken Island, this site was named after Mike Severns, a renown underwater photographer. Beautiful corals with tropical reef fish in abundance, beautiful anthias and angelfish, napoleons, morays, scorpion fish, but also some small such as mantis shrimp and pygmy seahorses. Sachiko I and II: plenty of life on these steep wall with massive corals. Expect to see napoleon wrasse, green turtles, damselfish, angelfish, as well as whitetip sharks resting in caves and black tip sharks cruising in the blue. Mandolin: the site faces the island of Manado Tua. A superb drift dive, along a vertical dropoff that goes down to 600 meters (1968 feet). Small caves as you go deeper. Tunas, sharks, eagle ray, fusilier and moray eels are frequently sighted. Manta Sandy: located off Arborek island, Manta Sandy is a very popular dive site in Raja Ampat, both for mantas and divers! Reef manta rays come here every day as it is a cleaning station. With a depth of only 18 meters (59 feet), it is suitable for all divers levels. The number of divers allowed at the site is regulated by the dive operators themselves. Cape Kri: the dive site has become world reknown since Gerald R. Allen, famous author of 33 books on fish species had counted then the world record number of fish on a single dive: 374. With two eco-resorts right next to this magnificent dive sites it’s now very easy to dive there over and over. The Passage: this is a unique dive site which is actually a river between two islands. This very unique ecosystem provides habitats for mangroves, lots of nudibranches - they are all over the place, and you can even swim through a cave. Mike’s Point: located in the middle of Dampier Strait it has an interesting topography with lots of bumps, dips and walls. Its depth goes down to 30 to 40 meters (98 to 131 feet) and makes it a good spot to see white tip and black tip reef sharks. Closer to the surface you can see Wobbegong Sharks, turtles, and of course, plenty of fish species. Blue Magic: located near Kri Island, it is an open water reef running from 7 meters down to 30 meters (22 to 98 feet). With a superb topography, relatively clear waters and big schools of pelagic fish, it is a truly magical dive. Expect to see jacks, barracudas, tunas, mantas and sharks. We always recommend to have your own dive gear, well maintained, you’ll be safer and more comfortable. Light and compact dive gear is particularly suited for travels. For safety reasons, always bring with you a surface marker buoy, and know how to use it. We also recommend you to have a Nautilus Lifeline, a GPS that could save your life if taken by currents. They can be really strong in Komodo, Raja Ampat and Bunaken. Finally, you could consider a ‘reef hook’, but only use it on rocks please. Gloves are usually forbidden, and it’s for the best! If you come from Bali, it’ll take you one or two days to reach Yogyakarta. There are volcanoes to see on the way so it won’t just be a road trip. From there, you are close to Borobudur, the world’s largest buddhist temple, built in the 9th century. Truly spectacular, with views on the jungle, we recommend you to get there early. Spend another day to visit Prambanan temple. Also build in the 9th century, it is though totally different as it is a hinddu temple. Plan to spend a few days to explore Ubud, a paradise for foodies, yogis and anyone who just like nature! Rent a scooter for as little as 5 euros a day and go up North to walk through Tegalagang rice terraces, some of the most beautiful of Bali. Another popular walk is the one leaving from Central Ubud ending up near Karsa Spa, beautifully located in the middle of rice fields. Book your massage at least 10 days in advance, you won’t regret it! If you decided to go to Nusa Penida for a few days, you cannot miss Kelingking Beach viewpoint. To reach it, you can either rent a scooter or go with a shared transport. The later option is probably the best unless you enjoy riding through roads that are filled with holes! The view point is spectacular… and there are many tourists, so arrive early. You can go down to the beach through a path that goes right down the cliff, but as it is written, it is “at your own risk”. Enjoying the view drinking a fresh coconut from the top is not that bad afterall! The view from the platform in Pianemo island certainly contributed to make Raja Ampat famous: you’ll see georgeous islands surrounded with emerald green waters. And when you know the underwater life is one of the richest in the world, it makes it even more beautiful! Do some dives before or after going to the view point, they are beautiful sites with swim throughs, interesting topography, and many back tip sharks in the area. Most international airlines have flights going to Bali airport, Denpasar (DPS). Air Asia has low cost flights from main cities of Asia such as Singapore, Kuala Lumpur, Bangkok or Hong Kong, and the airline also flies to Perth, Melbourne and Sydney in Australia and Auckland in New Zealand. You can reach Lombok by a super short flight from Bali or go there with a slow or speed boat. To go to Labuan Bajo (LBJ), the main gateaway to Komodo National Park, take a flight with Garuda, Wings Air or Lion Air. There are about 6 flights per day from Bali to Labuan Bajo and it only takes an hour and a half. Another option is to embark on a liveaboard from Bali to Komodo and back! To go to Bunaken Marine Park, you first need to reach Manado (MDC) and then take a boat to one of the islands of Bunaken Marine Park. From Singapore, catch a direct flight with Silk Air or Singapore Airlines. If coming from Bali, you can fly with Garuda Airlines to Manado via Makassar, South Sulawesi. Raja Ampat is remote, and that’s probably one of the reason it is still very well preserved. From Jakarta or Bali, take a flight to Sorong, West Papua. 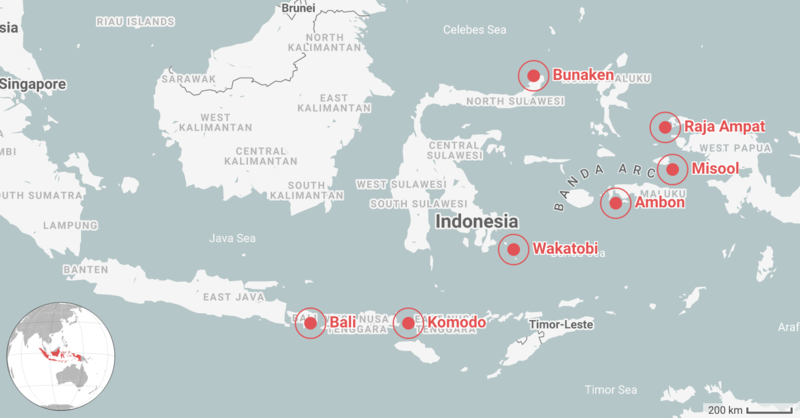 You will have to make one stop either in Makassar or Manado, in Sulawesi province. Plan to arrive a day in advance as there are many connections. © 2019 SeaCrush. All rights reserved.